Looking for a quick and healthy lunch idea? This is the BEST easy Avocado Toast Recipe! It’s so delicious and only takes 5 minutes to make. Topped with goat cheese spread, fresh avocado, arugula, grape tomatoes, and sprinkled with a dash of salt and pepper! Seriously soooooo obsessed with this avocado toast recipe, y’all! It’s basically all of my favorite things ever combined into one, delicious, vegetarian lunch. Or dinner. Or breakfast. Or snack. It’s creamy and crunchy heaven, loaded with savory avocado, peppery arugula, soft goat cheese, and lightly grilled or toasted bread. My absolute fave! Grill or toast the bread. Top with your choice of spreadable cheese. Add fresh arugula or spinach. Top with sliced tomatoes, salt, & pepper! I also HAD to share this tip with you guys about avocados! I’m sure most of you guys already do this, but if you don’t then you should totally buy your avocados in bulk (much cheaper that way!) when they’re super green (not ripe). Put them in the produce drawer of your fridge and they can last for a long time! Like, weeks, people! It’s the best. Just take them out a few days before you need them, and they will be perfectly ripe just in time for this easy Avocado Toast recipe! P.S: This avocado slicer will solve ALL OF YOUR PROBLEMS. Not kidding! For this recipe, I used Ezekiel 4:9 Bread. This sprouted bread is my ABSOLUTE ALL TIME FAVORITE because it’s the “real” deal and is made completely of grains and legumes. I’ve used it in my French Toast and Gingerbread French Toast recipes, and love eating it in the mornings for breakfast or at lunch. I used spreadable goat cheese in this avocado toast recipe. However, feel free to use a different kind of spreadable cheese, cashew cheese, or omit the cheese completely! 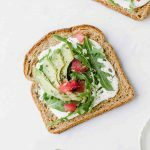 The BEST Easy Avocado Toast Recipe Your Entire Family Will Love! I loved this Grilled Avocado Goat Cheese Toast open faced, but Cody likes to put a little bit of deli turkey and another slice of bread on his to turn it into a sandwich. Either way, it’s amazing! Looking for a quick and healthy lunch idea? This is the BEST easy Avocado Toast Recipe! It's so delicious and only takes 5 minutes to make. Topped with goat cheese spread, fresh avocado, arugula, grape tomatoes, and sprinkled with a dash of salt and pepper! Toast or grill each slice of bread. Spread the goat cheese over each slice of bread. Top the toast with arugula, avocado slices, sliced tomatoes, salt, and pepper. Avocado toast is one of my favorite healthy recipes! I love how easy this variation is. And the goat cheese is so yummy! We are addicted to avocados here…we always have them in the house! And I love goat cheese too, so I can’t wait to try this! Drooling! This is right up my alley, love it! Thanks, Ahu! 🙂 Let me know if you make it! I want that! Looks great!